Well, here’s a little story about monkeys washing potatoes. 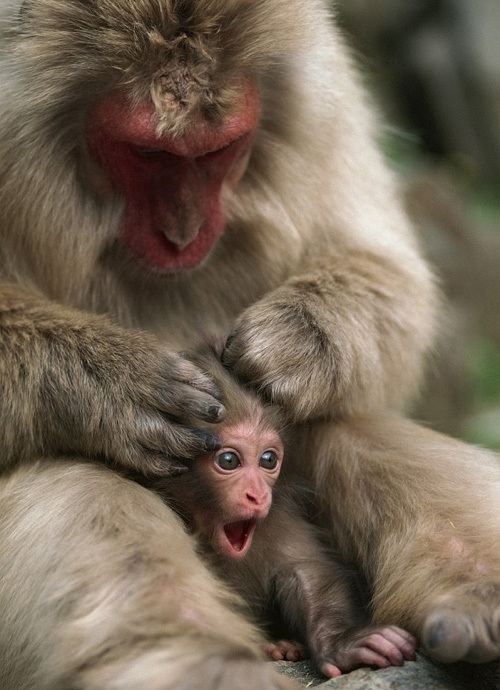 On the Japanese island of Koshima, there lived a tribe of macaque monkeys. It was the early 1950s, and a group of scientists had arrived on the island to study these curious creatures. One day, a young female macaque named Imo (the Japanese word for potato) decided to start dipping her sweet potatoes into a nearby river before eating them. Her reason was simple and entirely reasonable: she saw sand on the potatoes and wanted to wash it off. Yet, none of the older and more mature monkeys had thought of doing this before–they would only brush off the sand with their hands. Imo’s brothers and sisters saw her performing this unfamiliar cleansing ritual. Being monkeys, they began to ape her actions, plunging their own potatoes into the river. Soon, her mother followed suit. Evidently, this monkey family had discovered the joys of eating clean potatoes. What the scientists observed over the next few years was a dramatic change in potato-consuming behavior throughout the island. The practice of potato washing spread rapidly through the entire macaque colony, and within a decade, every capable macaque on the island was washing potatoes. But it was not only the technique of potato washing that the monkeys learned. At some point during those years of monkey-to-monkey knowledge sharing, Imo discovered a second hack to make her potato consumption more pleasurable–by dipping her potatoes in the ocean instead of the river, the saltwater would season the potato and make it taste better. After each bite, she would dip the freshly exposed section of her potato back into the ocean to enhance its flavor. 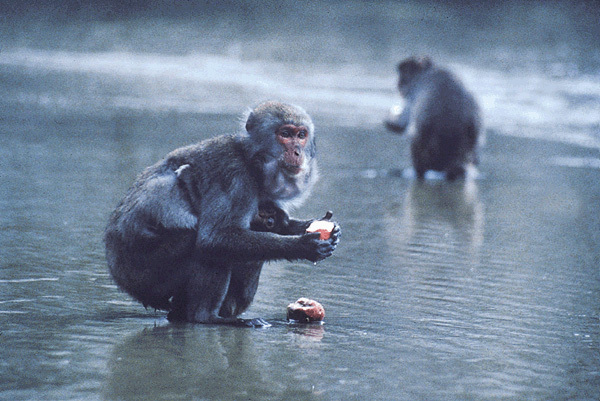 This habit spread just as quickly through the macaque community. These practices of potato washing and dipping were passed down for generations. To this day, though none of the original macaques are still alive, the monkeys of Koshima now enjoy clean, flavor-enhanced potatoes. Are these potato-consuming habits merely a group-specific behavior, or can it be considered the “culture” of the monkeys? In 1971, Hans Kummer made a keen observation that species adapt to their environment primarily through two processes: phylogenetic adaptation, a gradual evolution of the species at the genetic level, and adaptive modification, the adaptation of an individual member of the species to its current environment. The latter, adaptive modification, can arise as a result of ecological factors such as climate change or an increase in predators. Alternatively, a species may adapt due to social factors–adapting due to the influence of others in the animal’s social group. Then, Kummer suggests that if a species exhibits unique changes in behavior due to social factors, the result can be considered a form of culture. This fits perfectly with the story of the monkeys above. However, when the story was originally published, many anthropologists and psychologists were uncomfortable with labelling their new behavior as “culture”. These critics saw the behavior of the monkeys as nothing remotely close to our own sense of human culture; after all, we humans have our many languages, customs, local cuisines, and art, all of which would be considered aspects of culture far beyond this single behavioral change seen in the monkeys. One might see this as mere linguistic nit-picking, as the boundaries of the term culture are not exactly clear. But after a landmark study was published in Nature in 1999 describing the localized habits and behaviors of chimpanzees in seven separate environments, even critics found it difficult to disagree with the notion that chimpanzees exhibit behavioral patterns similar to what we consider human culture. This study, by Andrew Whiten and his colleagues, discovered 39 unusual habits specific to certain monkey populations where the catalyst was found to be social rather than ecological adaptation. These were habits that included patterns of tool usage, grooming and courtship behaviors, and meal-time activities. For example, some populations would catch ants on a short stick and eat them one by one. Others, on the other hand, had discovered a more efficient technique of catching ants on a longer stick, many at a time, and sweeping them all into the mouth at once. Some populations picked their nostrils with sticks. Some cracked open hard-shelled foods by smashing them onto wood; others used stone. Some monkeys would even dance at the start of a rainfall. These are habits that almost certainly did not derive from genetics; it would be difficult to imagine that evolutionary pressure would cause a monkey to dance in the rain or change the way she fishes for ants. Further, Whiten found significant behavioral differences even in two populations of the same species living apart, providing evidence against any genetic explanation for their habits. The evidence overwhelmingly points to the idea that chimpanzees are not only highly capable of creating new customs and behaviors, but spreading them through their social nature. It is, in this way, that we see the “culture” of monkeys–a method of passing on habits and customs not so different from the way human culture develops. When we think of culture, we nearly always think of human culture. But we are not unique nor alone in our ability to develop peculiar social behaviors. In fact, we hardly need to look beyond ourselves to find other animals who, like us, can learn from one another, develop new customs and practices, and pass their knowledge on to future generations. As humans, it is always humbling to realize that we are not so different from the animals around us because we, too, are only animals. De Waal, Frans B. M. “Cultural Primatology Comes of Age.” Nature 399, no. 6737 (June 17, 1999): 635–636. doi:10.1038/21310. Van Lawick-Goodall, Jane. “Cultural Elements in a Chimpanzee Community.” Precultural Primate Behavior (1973): 144–184. Whiten, A., J. Goodall, W. C. McGrew, T. Nishida, V. Reynolds, Y. Sugiyama, C. E. G. Tutin, R. W. Wrangham, and C. Boesch. “Cultures in Chimpanzees.” Nature 399, no. 6737 (June 17, 1999): 682–685. doi:10.1038/21415.